Description: This tutorial is an introduction to FIWARE STH-Comet - a generic enabler which is used to retrieve trend data from a MongoDB database. 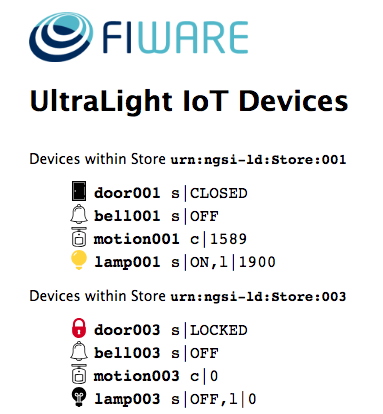 The tutorial activates the IoT sensors connected in the previous tutorial and persists measurements from those sensors into a database and retrieves time-based aggregations of that data. "The "moment" has no yesterday or tomorrow. It is not the result of thought and therefore has no time." 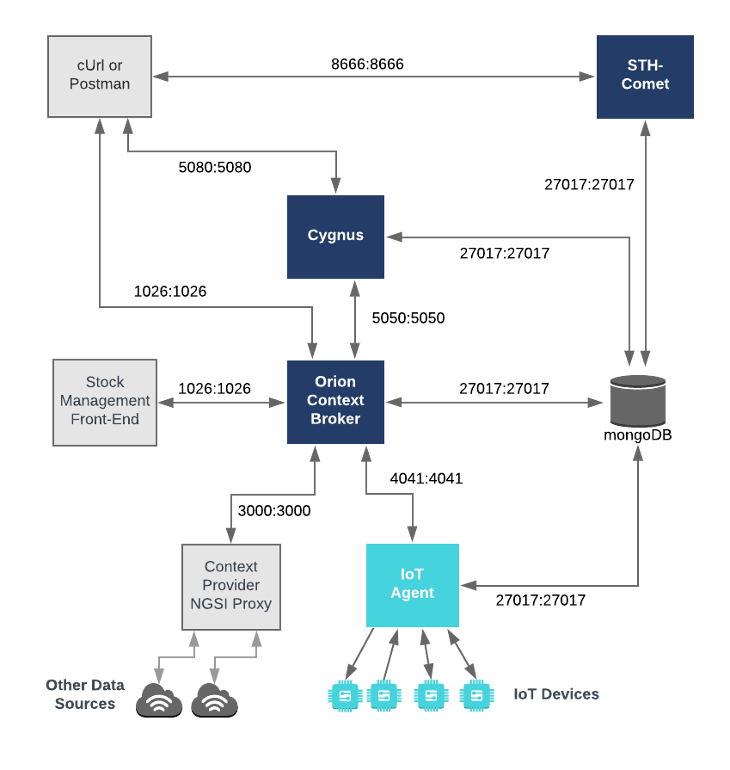 Within the FIWARE platform, historical context data can be persisted to a database (such as MongoDB) using a combination of the Orion Context Broker and the Cygnus generic enabler. This results in a series of data points being written to the database of your choice. Each time-stamped data point represents the state of context entities at a given moment in time. The individual data points are relatively meaningless on their own, it is only through combining a series data points that meaningful statistics such as maxima, minima and trends can be observed. In formal mode, the collection of data is delegated to Cygnus, STH-Comet merely reads from an existing database. What was the maximum measurement of a device within a given time period? What was the average measurement of a device within a given time period? What was the sum of the measurements sent by a device within a given time period? It can also be used to reduce the significance of each individual data point to exclude outliers by smoothing. This application builds on the components and dummy IoT devices created in previous tutorials. 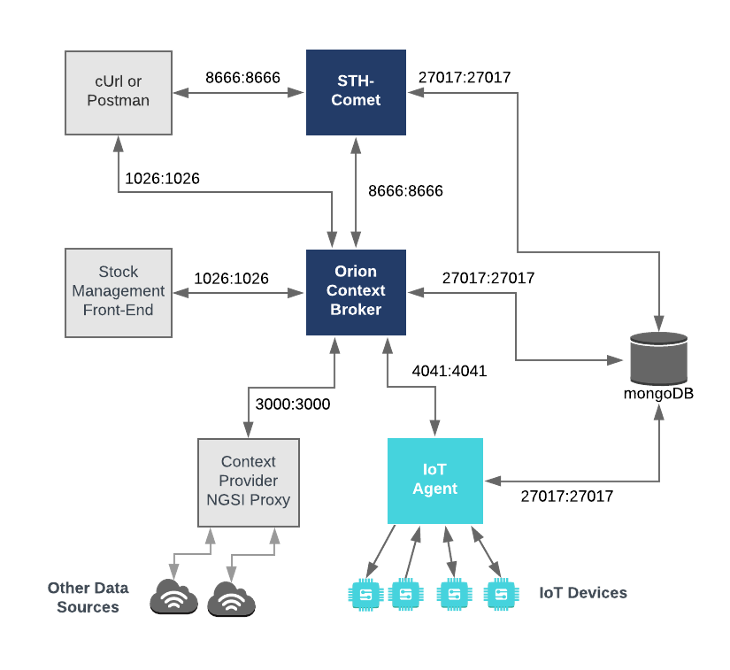 It will use three or four FIWARE components depending on the configuration of the system: the Orion Context Broker, the IoT Agent for Ultralight 2.0, STH-Comet and Cygnus. Note: Cygnus will only be used if STH-Comet is configured in formal mode. The specific architecture of both the minimal and formal configurations is discussed below. Where <command> will vary depending upon the mode we wish to activate. This command will also import seed data from the previous tutorials and provision the dummy IoT sensors on startup. Once STH-Comet is running, you can check the status by making an HTTP request to the exposed STH_PORT port. If the response is blank, this is usually because STH-Comet is not running or is listening on another port. You should see several containers running. If sth-comet or cygnus is not running, you can restart the containers as necessary. Once a dynamic context system is up and running, under minimal mode, STH-Comet needs to be informed of changes in context. Therefore we need to set up a subscription in the Orion Context Broker to notify STH-Comet of these changes. The details of the subscription will differ dependent upon the device being monitored and the sampling rate. The rate of change of the Motion Sensor is driven by events in the real-world. We need to receive every event to be able to aggregate the results. The idPattern in the request body ensures that STH-Comet will be informed of all Motion Sensor data changes. The attrsFormat=legacy is required since STH-Comet currently only accepts notifications in the older NGSI v1 format. The luminosity of the Smart Lamp is constantly changing, we only need to sample the values to be able to work out relevant statistics such as minimum and maximum values and rates of change. This is done by making a POST request to the /v2/subscription endpoint of the Orion Context Broker and including the throttling attribute in the request body. Note: Be careful when throttling subscriptions as sequential updates will not be persisted as expected. For example if an UltraLight device sends the measurement t|20|l|1200 it will be a single atomic commit and both attributes will be included the notification to STH-Comet however is a device sends t|20#l|1200 this will be treated as two atomic commits - a notification will be sent for the first change in t, but the second change in l will be ignored as the entity has been recently updated within the sampling period. The queries in this section assume you have already connected STH-Comet using either minimal mode or formal mode and have collected some data. STH-Comet will only be able to retrieve time series data if sufficient data points have already been aggregated within the system. Please ensure that the Smart Door has been unlocked and the Smart Lamp has been switched on and the subscriptions have been registered. Data should be collected for at least a minute before the tutorial. The result should not be empty. This example shows the first 3 sampled luminosity values from Lamp:001.
the hLimit parameter restricts the result to N values. hOffset=0 will start with the first value. This example shows the fourth, fifth and sixth sampled count values from Motion:001. This example shows latest three sampled count values from Motion:001. If the lastN parameter is set, the result will return the N latest measurements only. The aggrMethod parameter determines the type of aggregation to perform over the time series, the aggrPeriod is one of second, minute, hour or day. Always select the most appropriate time period based on the frequency of your data collection. minute has been selected because the Motion:001 is firing a few times within each minute. Querying for the mean value within a time period is not directly supported. This example shows sum of luminosity values from Lamp:001 over each minute. When combined with the number of samples the within the time period an average can be calculated from the data. The luminocity of the Smart Lamp is continually changing and therefore tracking the minimum value makes sense. The Motion Sensor is not suitable for this as it only offers binary values. The Management Port for Cygnus - 5080 is exposed purely for tutorial access - so that cUrl or Postman can make provisioning commands without being part of the same network. Once Cygnus is running, you can check the status by making an HTTP request to the exposed CYGNUS_API_PORT port. If the response is blank, this is usually because Cygnus is not running or is listening on another port. Troubleshooting: What if either response is blank ? In formal mode, Cygnus is responsible for the persistence of historic context data. Once a dynamic context system is up and running, we need to set up a subscription in the Orion Context Broker to notify Cygnus of changes in context - STH-Comet will only be used to read the persisted data. The idPattern in the request body ensures that Cygnus will be informed of all Motion Sensor data changes. The attrsFormat=legacy is required since Cygnus currently only accepts notifications in the older NGSI v1 format.